Prepare yourself for a truly extraordinary release from Earth Mantra. 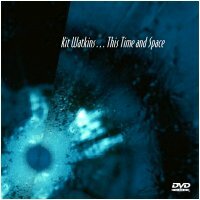 This release from Kit Watkins, called This Time and Space, is an hour long collection of seven great tracks, released not as MP3 files but as a single multimedia experience for your home entertainment center -- a full length video DVD! That's right, folks, this release includes some of Kit's most beloved music, performed live and improvised in the studio, together with some eye candy visuals that seamlessly interact to produce a whole new listening and viewing experience. If you love ambient music and wondered about the fusion of ambience with lush, slowly evolving images, look no further; this is the release for you. As one would expect from Kit Watkins, the music on this DVD is gloriously beautiful, but we really have to emphasize that the eye popping visuals add a whole new dimension to the experience. There is something synergistic about combining enigmatic imagery with such lovely music, something that makes the end product much greater than the sum of its parts. In fact, this DVD is perfect for playing in the background while talking with friends, perfect for playing on the entertainment center in the bedroom as you fall asleep, or frankly, perfect for simply sitting and listening/watching with a nice cup of tea by the fire. Earth Mantra is very proud to bring you the music of Kit Watkins via Creative Commons, but at the risk of patting ourselves on the back too much, we have to say that this is one of the freaking coolest things we have ever released. It's a big download, to be sure, but it is one that is well worth the time and bandwidth. A must-have for all fans of ambient music. Instructions for creating the DVD are included in the readme file.